Busy week back at work - lots of catching up to do. 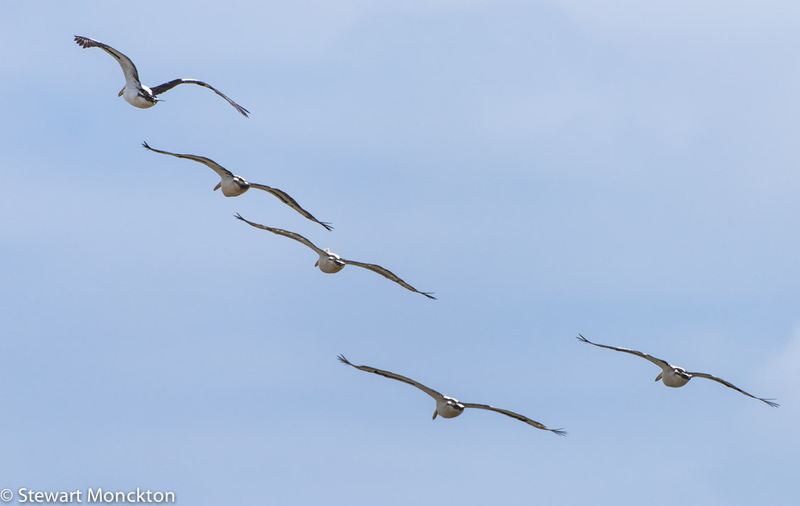 Rather like this image of pelicans departing into the distance. Could not believe it when they organised themselves nicely in the frame. This was another shot I took while on a trip to Mud Islands, just off the coast from Queenscliff. 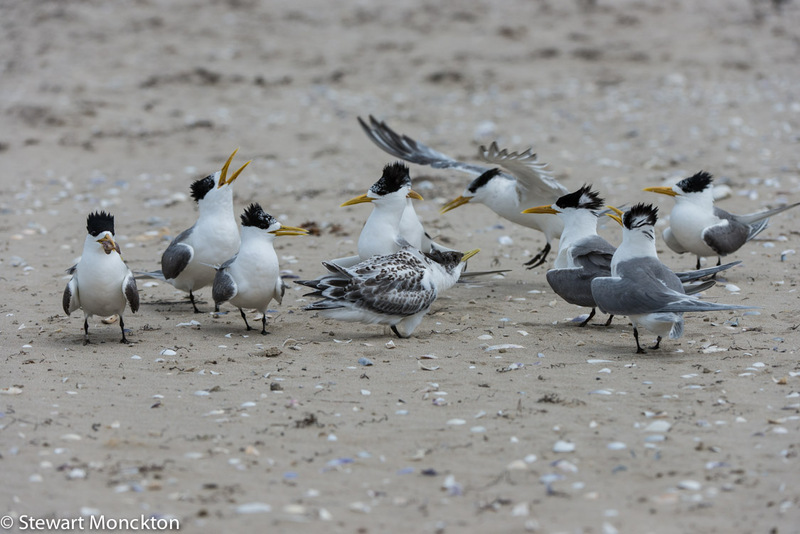 The Crested Tern can be found all around the coast of Australia - and I would not be surprised if it was not the main cause of "I've just seen a funny looking seagull" comments from huge numbers of people yet to join the fellowship of birders. 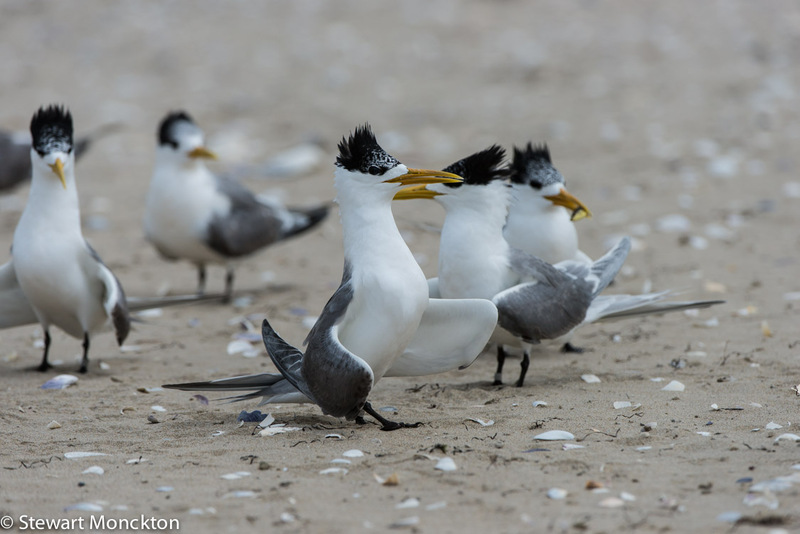 The Crested Tern is a little more cooperative than many birds, often allowing people to get reasonably close to them before they take flight. 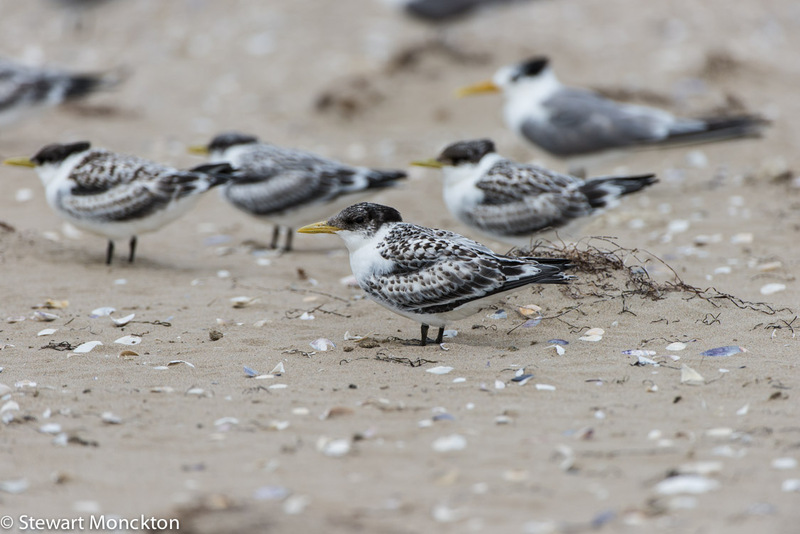 These birds were all part of a breeding colony on Mud Islands in Port Phillip Bay. As you will see, most of the chicks were well grown, although some had not yet taken to the air. 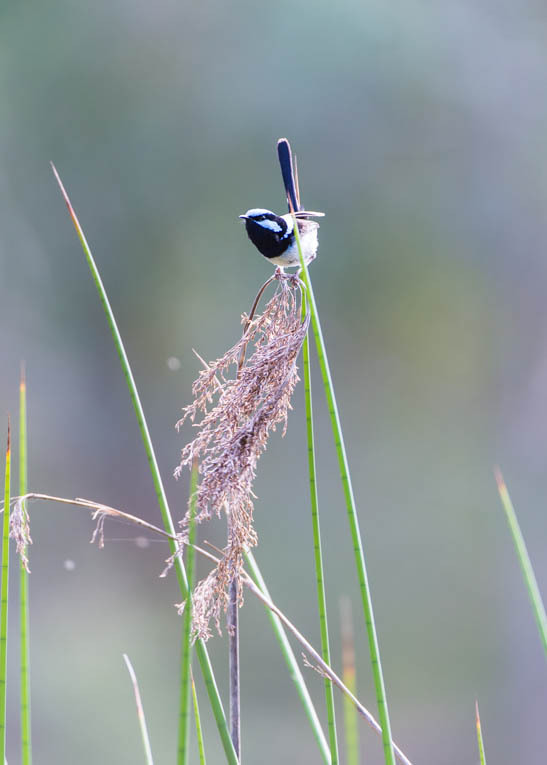 This bird goes under the scientific name of Thalasseus bergii - which means Bergius' Fisherman. The fisherman in obvious, and Bergius is the name of the "short lived" German collector who collected the type specimen in souther Africa. In some books this bird may still be called Sterna bergii - which means Bergius' Tern. 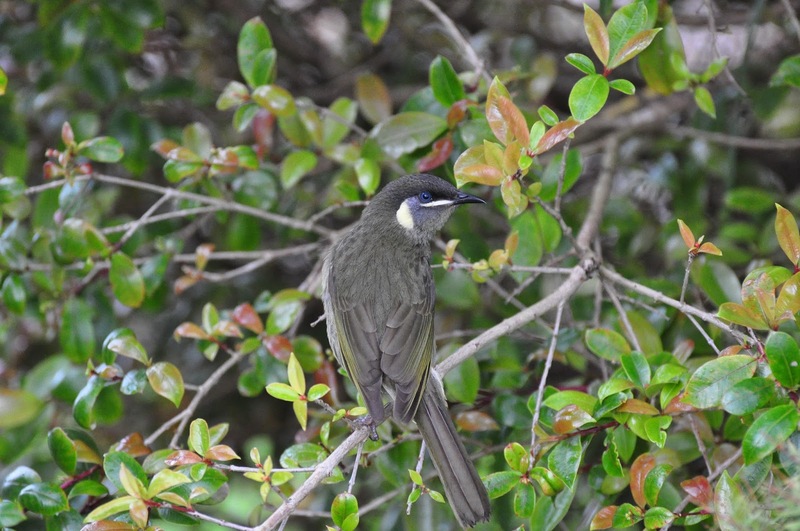 Recent studies of the DNA found within the mitochondria of this birds cells resulted in the bird being moved from one genus to another to which it was more closely related. This shows a nice little rule of taxonomy, where the second part of the name follows the bird about, even if the first part changes. These birds are about 44 - 48 cm long, with a wing span close to 1m. 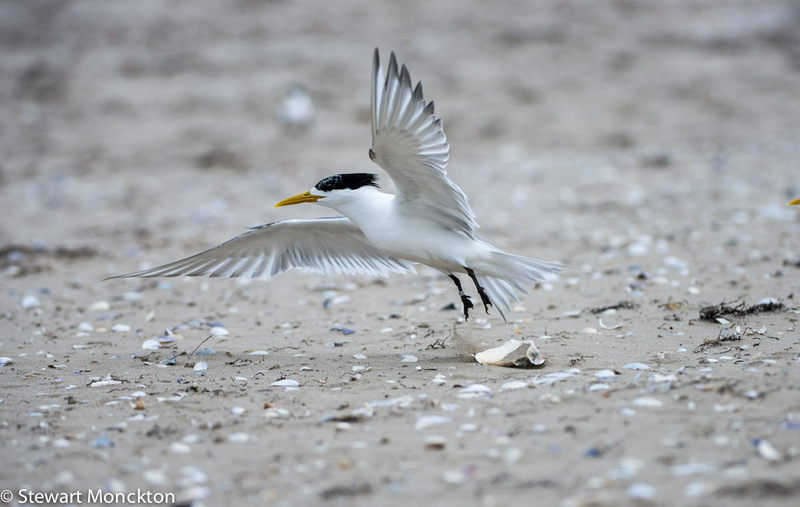 Like most terns they are a delight to watch in their grey, white and black washes. I think this is my favourite image of the many I took. 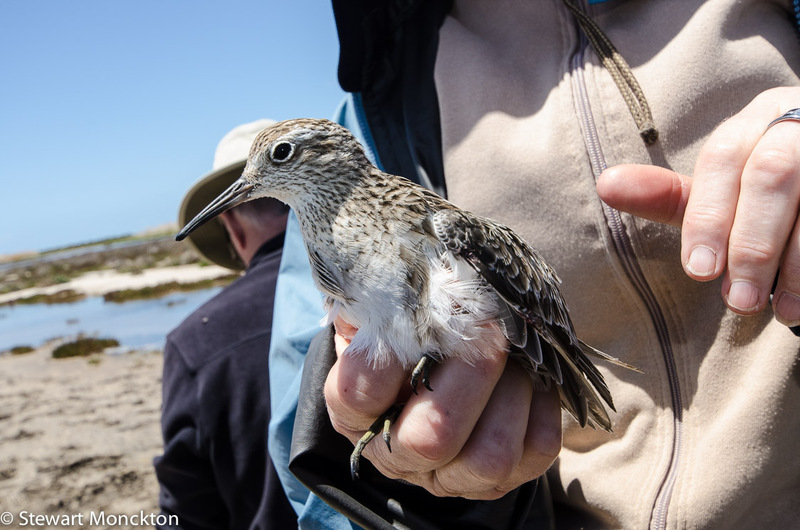 As the bird is banded there is a remote possibility that I had this bird in the hand as a chick. Apart from the bird, I like the puff of sand caused by its feet as it pushes in the air. Well grown chick begging for food. 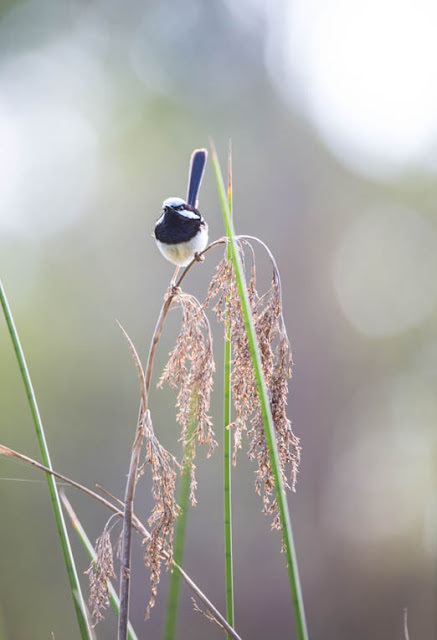 I have a real fondness for these birds - in the afternoon of the first day I arrived in Australia I took a walk along Swan Bay pier and saw some of these birds. This makes them a prime candidate for being on of the first birds I added to my life list in this wide brown land. 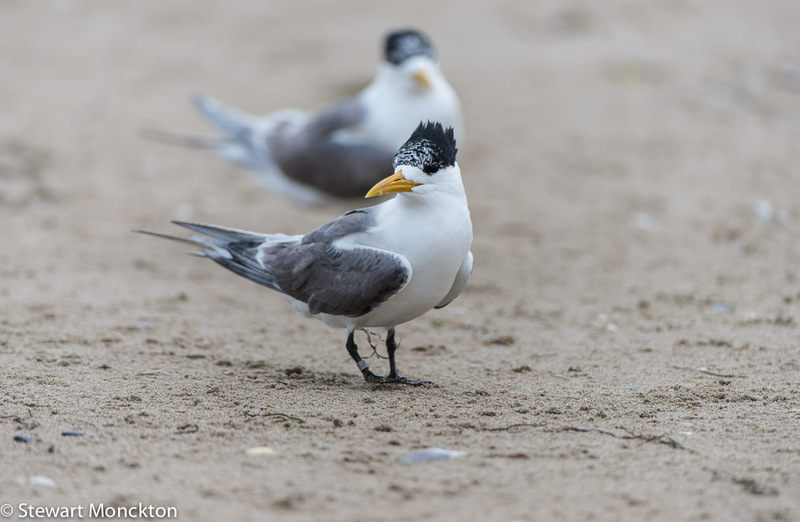 Now it's your tern (!) to add a link. Feel free to spread WBW through what ever networks you have - the more links the merrier. Today was the last day of my summer holidays - its a public holiday for Australia Day. The 26th is the actual day, but because that was a sunday, we get monday off. Back to the desk tomorrow! 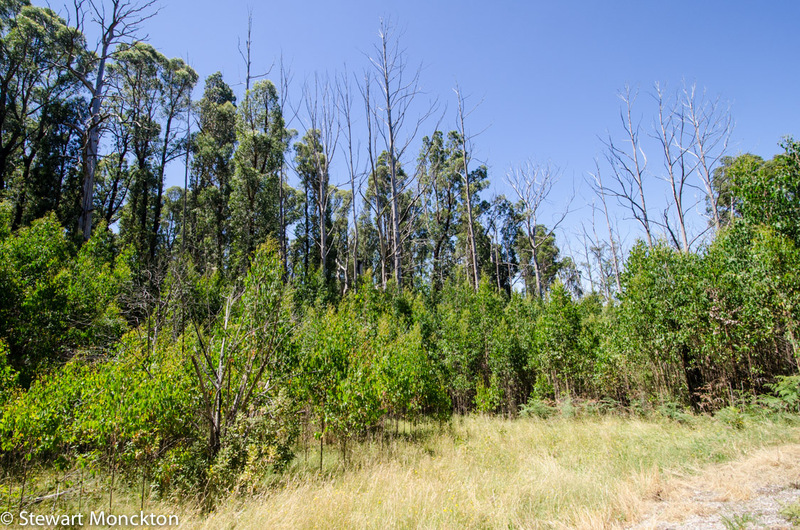 Just a short walk through some forest that was badly burnt in the Black Saturday bush fires of 2009. There are many signs of regeneration in the forest - I hope the people of the area are doing as well. In this picture you can see that some of the mature trees survived the fire, but many are now just dead stags heads. These will become important wild life sites over time. You can also see the huge numbers of young trees in the fore ground - these forests have evolved with fire, but it remains questionable that they will be able to survive the increased fire frequencies that come with human activity and / or climate change. Its still very dry here, and the next few days are back into the extreme heat level. This whole area could burn again, which is not a happy thought. As we were driving home I noticed this paddock dotted with hay bales - I rather liked the look of them, so here are two images. Both of these landscape shots look much better bigger - and you can see bigger versions if you click on the image. One of the many ways you notice that your kids are growing up is that the rides they want to go on at fairs change. Spinning tea cups are abandoned for bouncy castles, bouncy castles for roller coasters and so on - although I suspect that H may never really give up roller coasters! 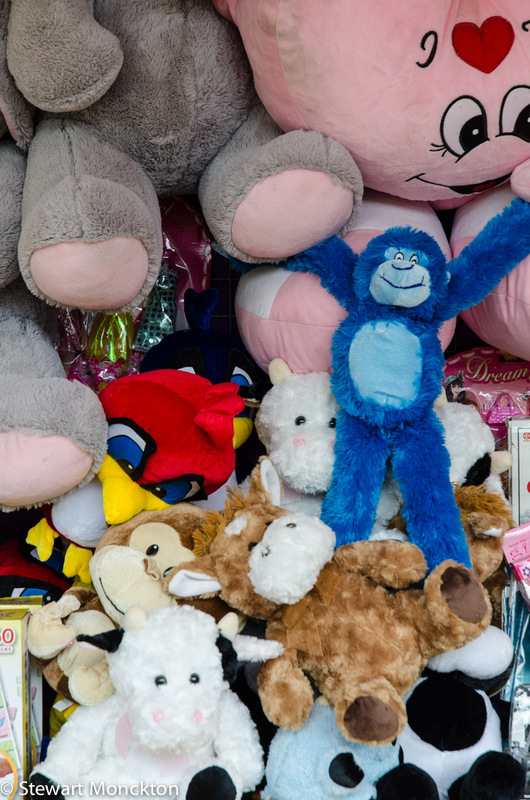 The stalls around the edges of the rides offer cheap tat as prizes and still tilt the odds in the favour of the stall holders. A few years ago the prospect of winning a water pistol with a life span of less than 12 minutes and a cuddly toy, stuffed with some form of industrial waste seemed attractive to my kids - but not so much now. Although they did seem attractive to me. 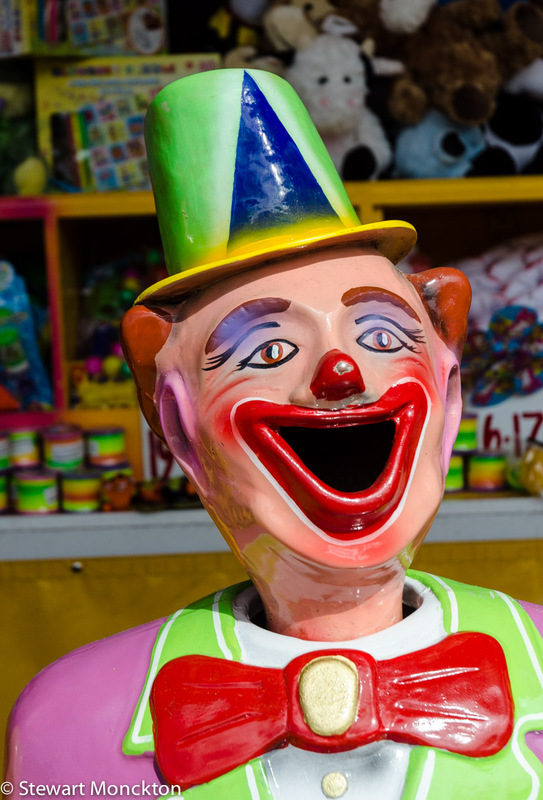 I can see why clowns weird out some people - the open face of this one reminds on the open mouthed scream that were used by the "pod people" in the Invasion of the Body Snatchers! And some of the soft toys are just a little to strange to become favourites! You can find more macro shots at Macro Monday2 and I Heart Macro. 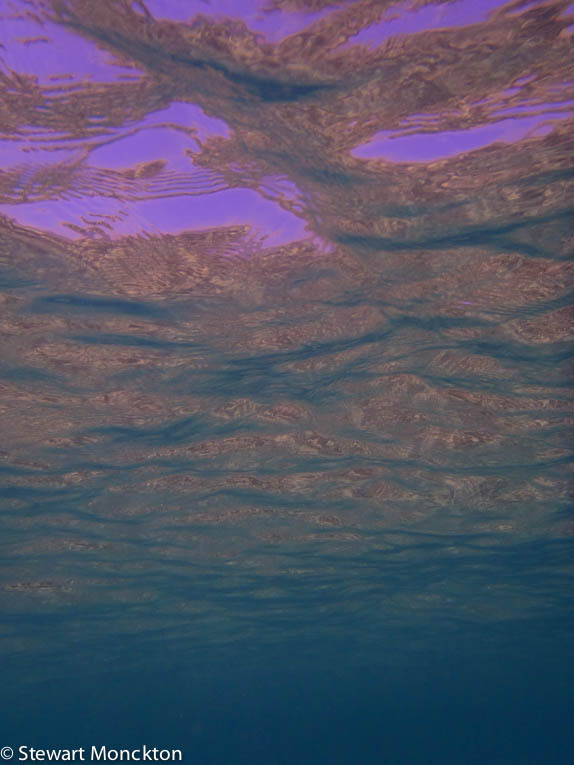 Sky from beneath the sea. 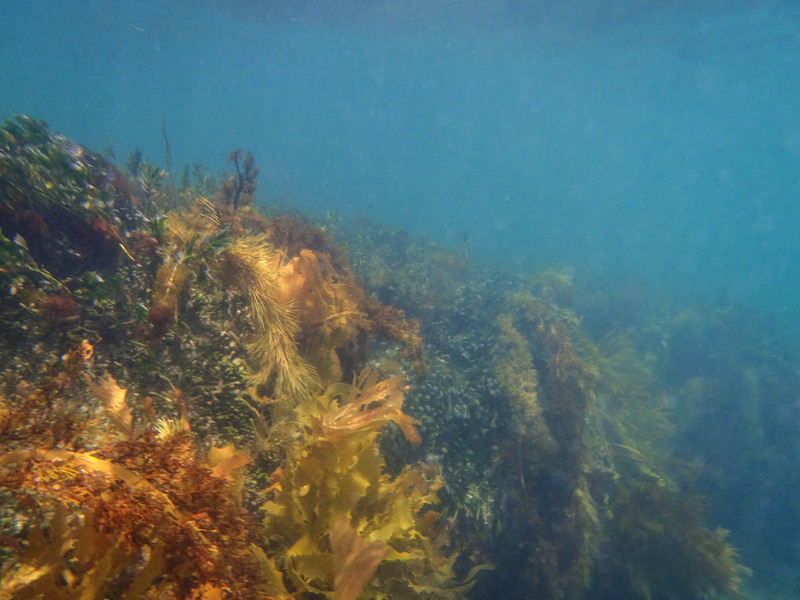 I may not have gone unnoticed that we have been spending a few days down at the beach - thankfully we were here during our recent very hot spell, so we spent a lot of time in the sea at the beginning and ending of each day. During the middle bits of the days it was too hot and the spectre of sunburn and its long term health impacts drove us back to shelter. 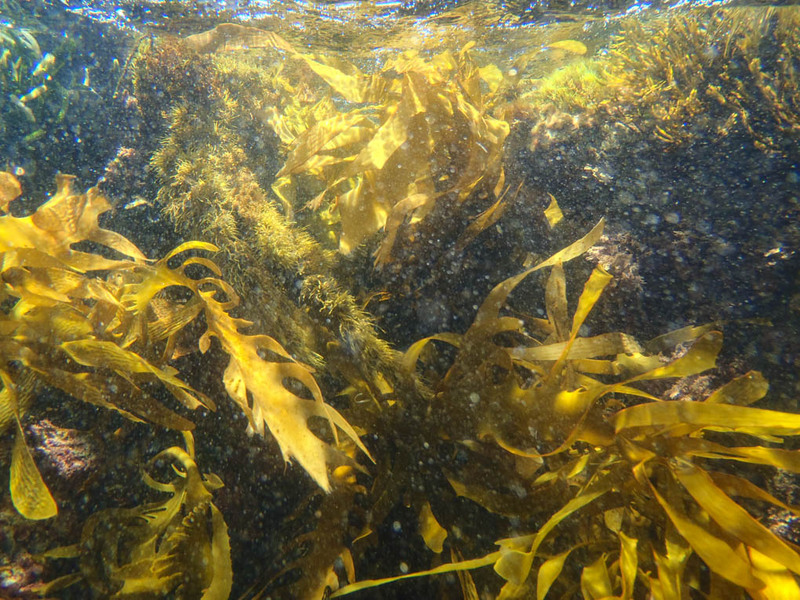 Once the kids had (briefly) exhausted themselves I would do a bit of snorkelling. I sorted out the "sun burn on the head" issue by using a very thin hood - normally warm under a wet suit in very cold water. It may look a bit over the top - but it seems to work well! 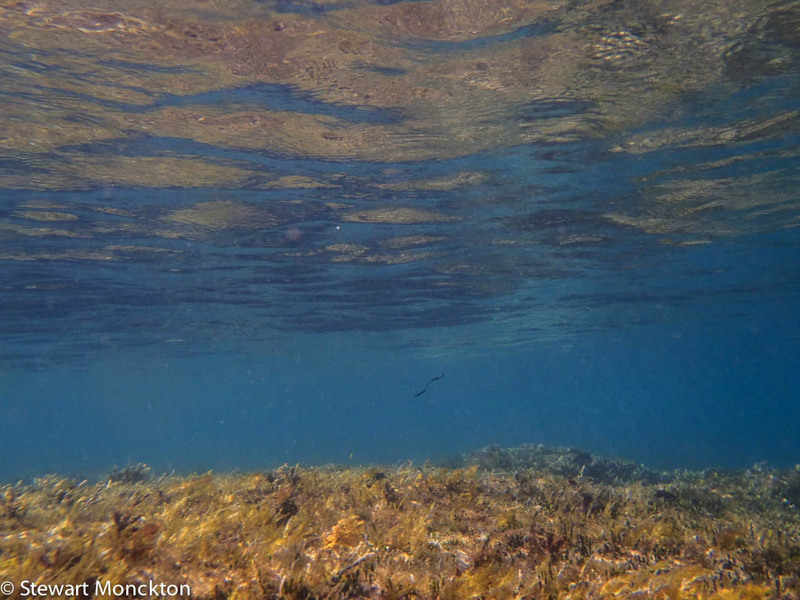 One of the things I like about snorkelling is the ability to be in that transition zone between water and air - and in this zone the light is refracted and reflected in many different ways. These images were taken with a little waterproof point and shot, held out in front of me and angled a little up at the sky. I rather like the results. You can find more sky shots (and less terms you last heard in Year 9 Physics!) at Sky Watch Friday. 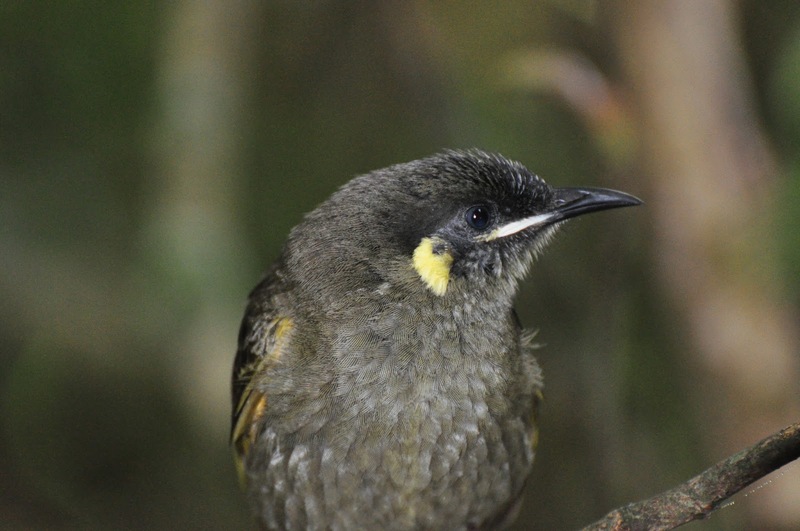 Wild Bird Wednesday 80 - Lewin's Honeyeater. I have engaged in a little bit of archive mining today - far too many new pictures need to be looked at and tagged. On days such as this, it's good to go back to the past. 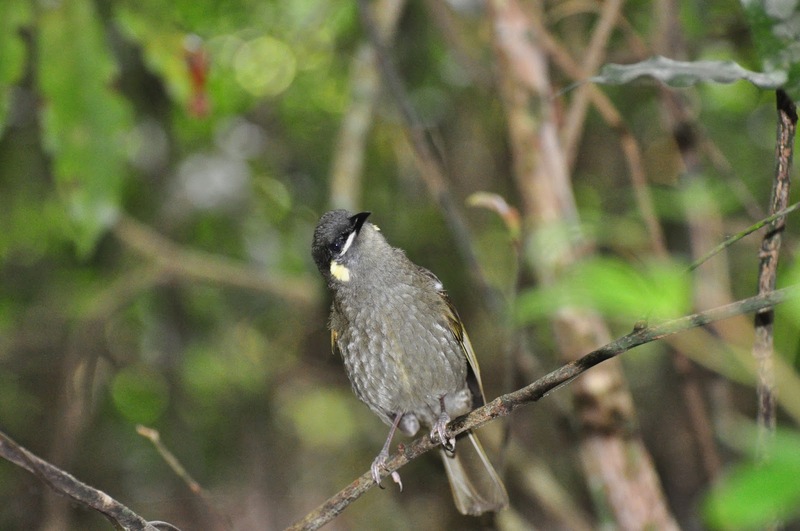 This bird is a Lewin's Honeyeater - one of a trio of very similar birds - so I hope I have my ID correct. These pictures were taken on a trip to the north coast of Australia a year or so ago. 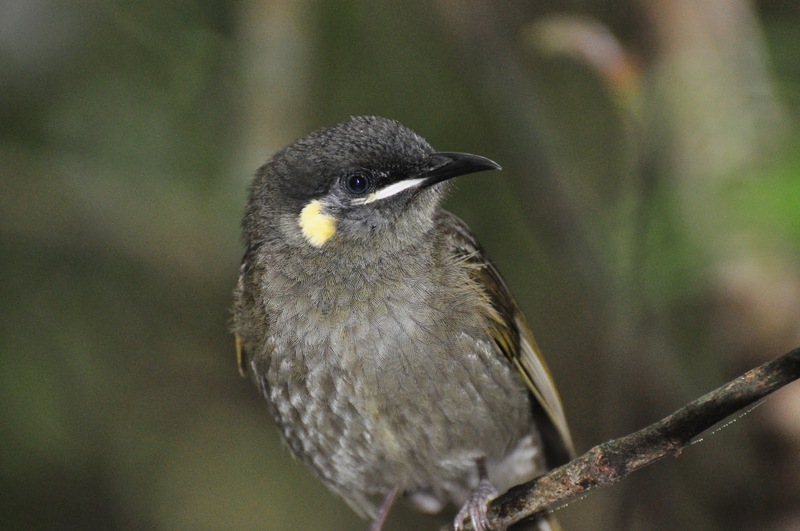 Along with parrots, gum trees and kangaroos, Australia is home to a vast number of honeyeaters - birds that have adapted to a wide range of habits, but have retained their basic structure. Such groups of animals always pose identification problems. I am briefly separated from my library, so I can say no more about this bird - apart from the it also goes by the name of Meliphaga lewinii. Normal service will be restored soon. So, over to you - click the link and off you go. Swan Bay pier sticks out from the end of Swan Bay Road into Swan Bay - which is suppose is not that surprising. 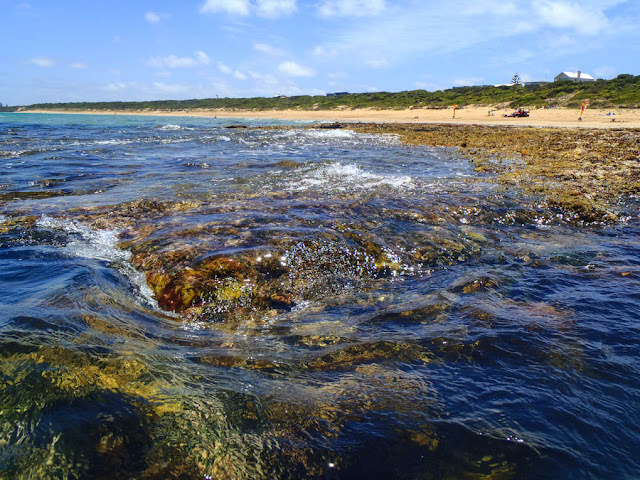 Swan Bay is a large tidal bay with a healthy population of swans - which is suppose is not that surprising either! 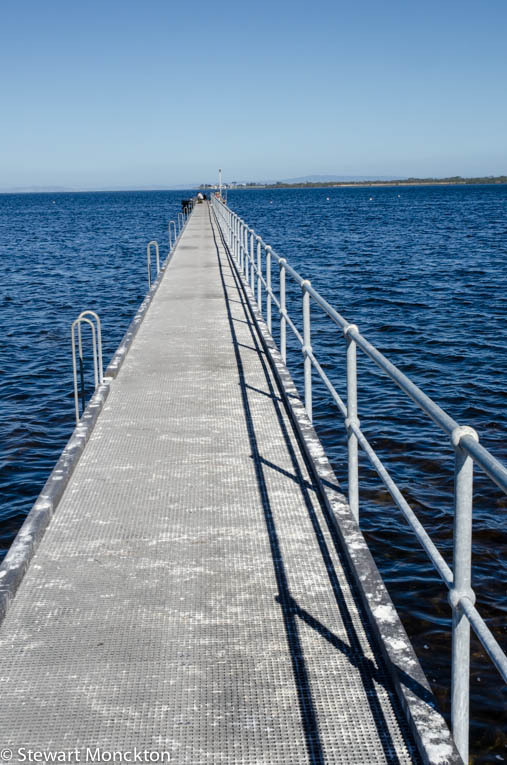 In case you don't know, Swan Bay is is about 2 hours west of Melbourne, and is really an extension of Port Phillip Bay on which Melbourne stands. Because my in-laws used to live near this pier I have walked along its decks many, many times - but I always seem to find something to look at and photograph. I saw the possibility of the panorama style shot of the pelicans as they swam towards me, and the perspective of piers is one of my favourite images. So, here are two pictures from my latest walk along this pier. During another evening walk this week I can across this rather splendid, colourful and symmetrical scene. It was one of a pair of such "doors" that flanked the real door of a cafe. As yet (disappointingly) I have not managed to find out if the coffee in this cafe matches the quality of its decoration. Yesterday was a day to warm the hearts of meteorologists - the temperature once again rushed past the 110 mark and in the evening much cooler sea-breezes kicked in to return the temperature to the merely warm. The amount of heat energy being poured into the air is bound to do something - so the evening rounded off the day with a remarkable show of thunder and lightning. It felt (and looked and sounded) as if there were three distinct storms active around our house. The thunder was remarkably consistent often with rumbles from all three storms overlapping. This is a picture from an evening walk - after the heat had dissipated, but the storms had not started. This is a cropped iPhone picture - remarkable really. Greetings one and all - lead is melting in the garden and steam is coming from my ears and the back of the computer - local temps got to almost 112! That too hot to even think. 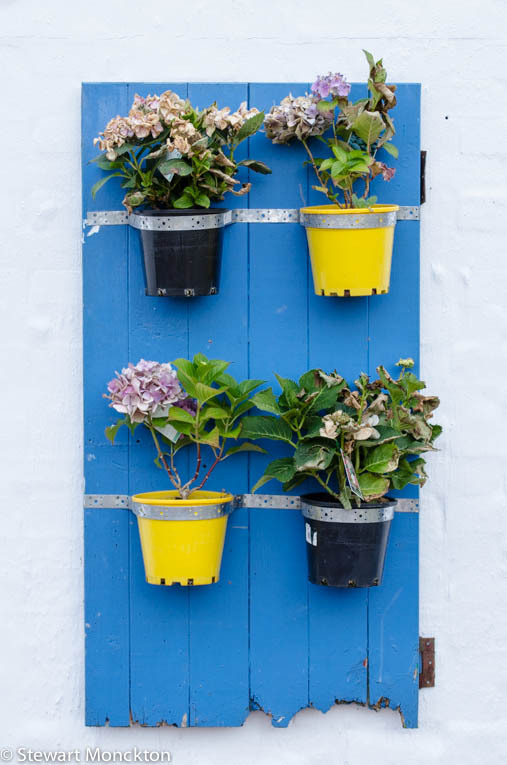 So, here are some images that were taken on a much cooler day. 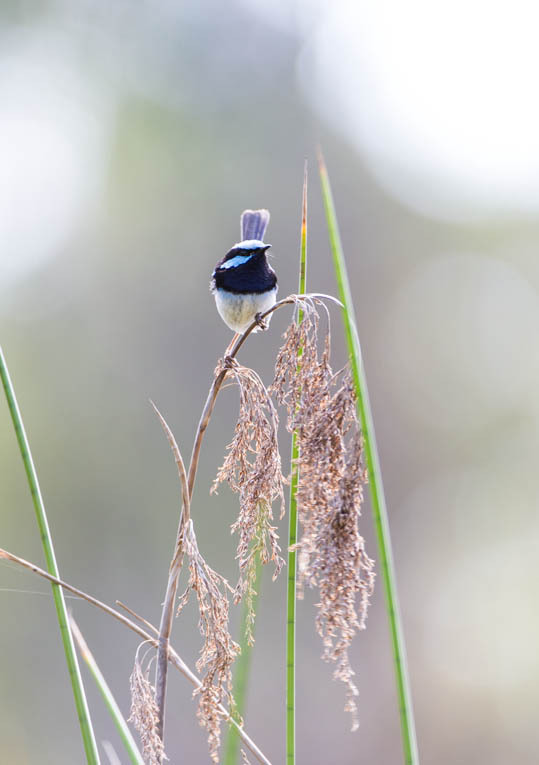 This is a male Superb Fairy-Wren. I was surprised when this bird popped up on to the top of a reed stem and stayed there for a while. I'm not sure if I like the reeds that cut across some of the images - but I do think they give the whole picture a depth. Also, I think it makes the bird look a little more hidden and secretive. Thats all from me - its too hot! Hope the weather is a little less brutal for you - please pass the WBW around any networks you have - the more links the merrier. 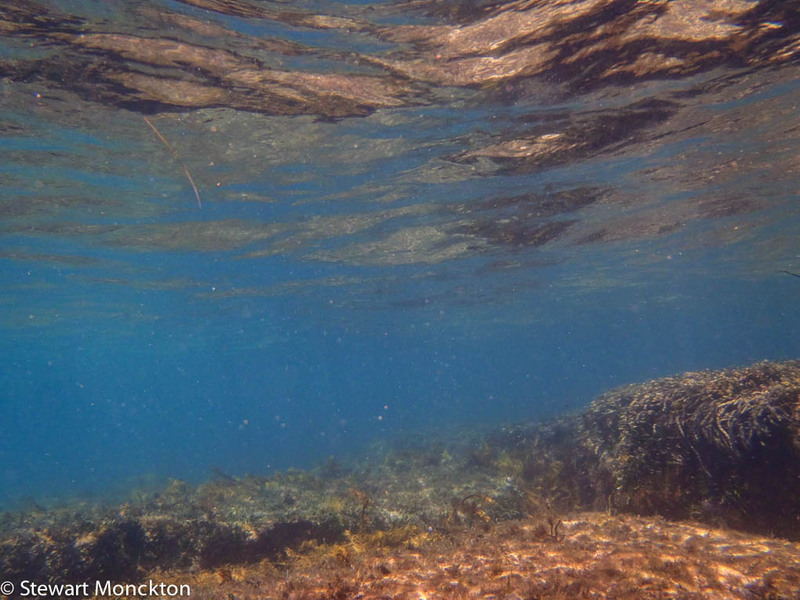 The next few days are forecast to be brutally hot - and on such days, relief can only be found by being underwater. Having said that, the prospect of sunburn on the bald patch is never good. I just can't seem to work out how to wear a hat while snorkelling! The cool waters off the SE coast of Australia are full of life - it's just that much of it seems to swim off before I can press the shutter button! 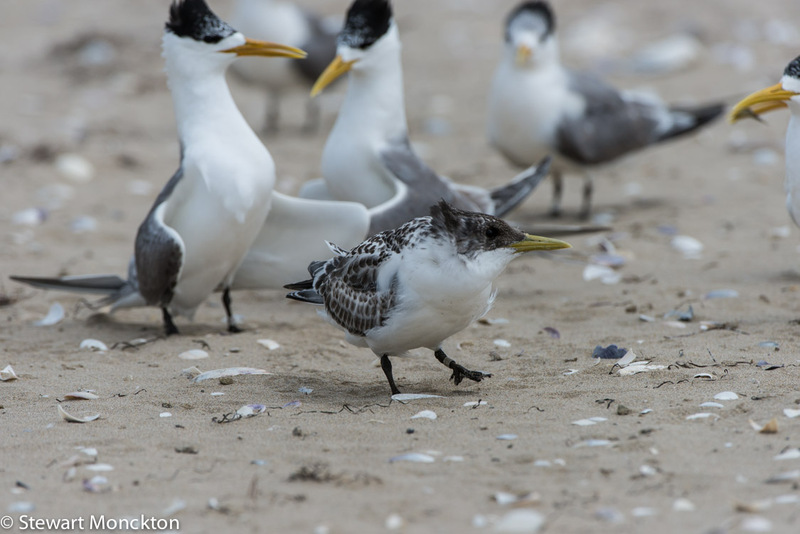 A month or so ago there were consistent reports of large numbers of Short-tailed Shearwaters either in distress or washing up dead on beaches around Melbourne. 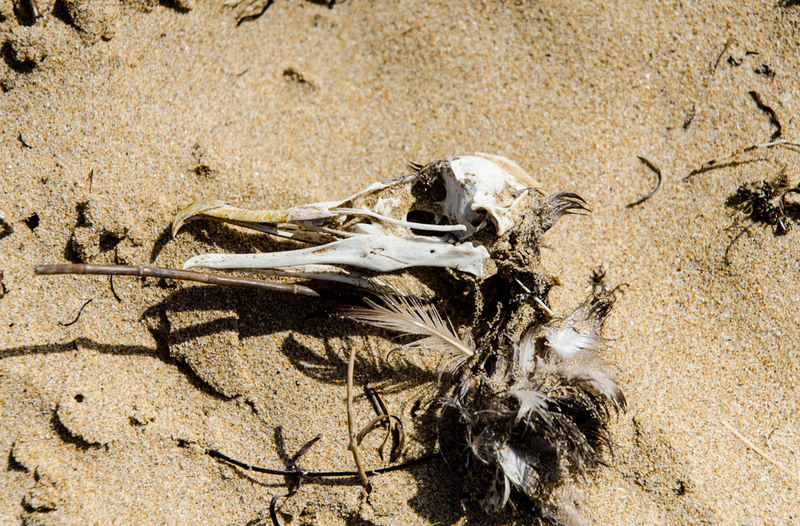 While I was walking on the beach at Queenscliff I found this skull, which is probably from one of these birds. It was not known if the deaths of the Shearwaters was caused by a problem in Australia, or if the birds were not in good condition when they left their breeding grounds in the northern hemisphere. 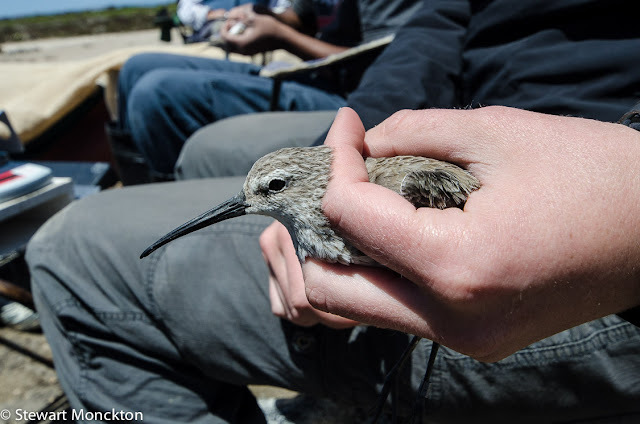 Whatever the reason, this find was a reminder of how fragile even birds with huge populations can be. This is another in my occasional series of "no sky" sky shots. 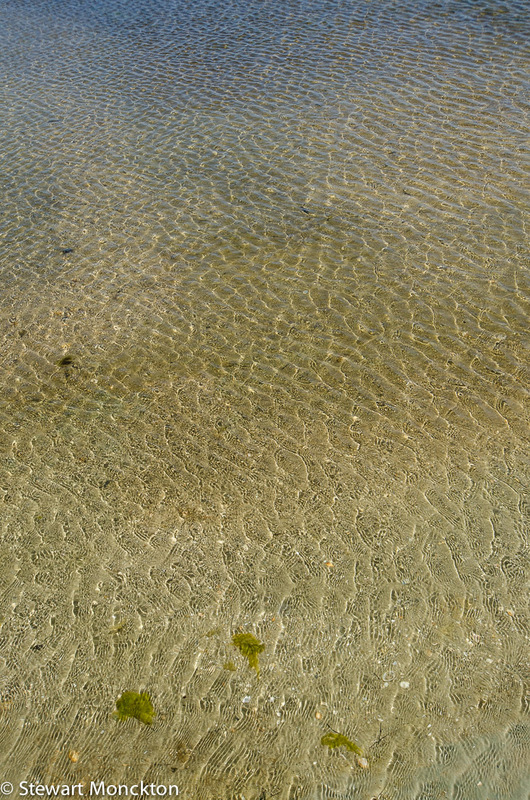 Bright, cloudless blue sky, a stiff wind and some shallow water. I like the patterns and the rippled brightness. You can find more sky shots - including ones with sky in them at Sky Watch Friday. The Eurasian Coot is a wide spread species; it's so wide spread that its one of the few species I see in Australia that also occurs naturally in the UK. With its black / grey plumage and white head shield it's hard to get this mixed up with many other birds. Good old Fulica atra can often be seen storming about ponds small and large - if ever there was a means of measuring aggression per ounce, I'm sure this bird would win! As a kid I can remember them running the length of long winter ponds to settle some obscure dispute with a member of its own species! I think the red eye speaks of a fiery temper. 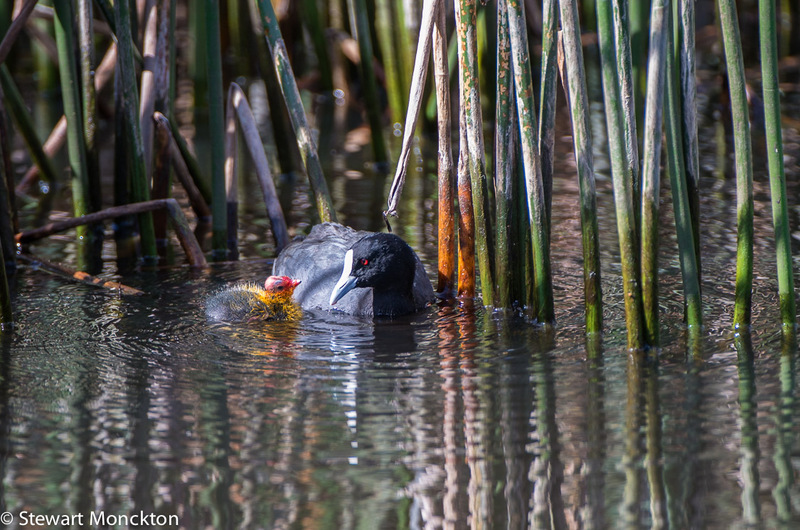 On sunday I found this rather more relaxed scene as a pair of coots fed their splendidly ugly chicks. 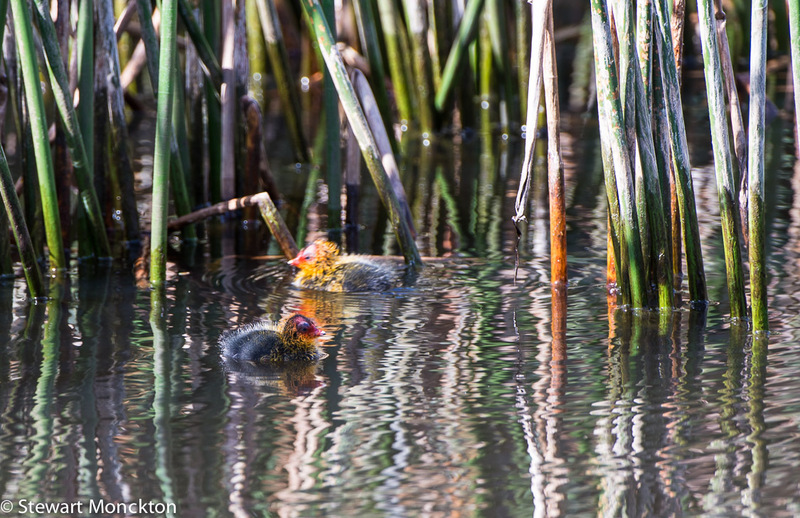 The term "bald as a coot" refers to the white head plate that the adults possess, but I was surprised to find that the chicks are bald as well. This family seemed very at home in the border waters between the reeds and the open pond. 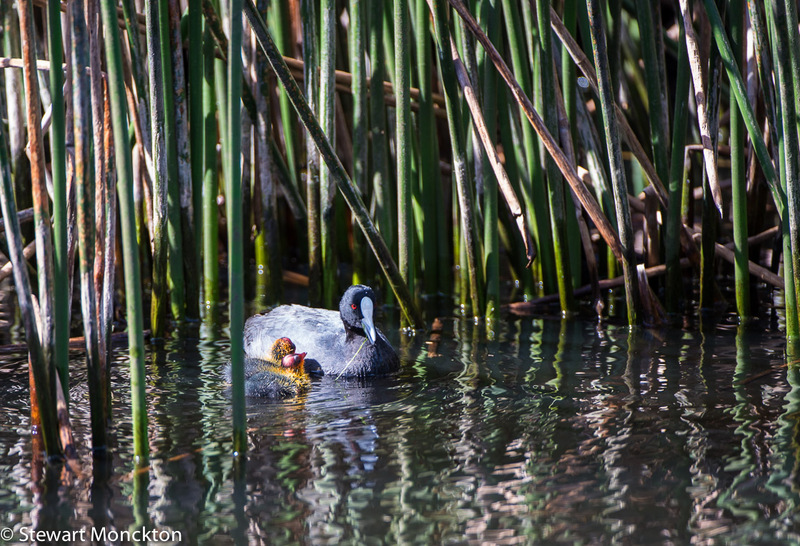 At some time in the future these Australian coots may become a separate species - not because of some rapid evolutionary change, but because taxonomists already suspect they not be the same species as is found else where - I'll have to wait for the studies to be done before I can get that tick! Now it's your turn to join in with WBW. Good number of bloggers had been linking at the end of last year - but we can always find space for more! So, invite away and don't forget to link back here! Click the link and off you! We took down the Christmas tree and decorations today. I am always struck by how bare a room can look for a few days without the decorations that have only been there for a week or so. 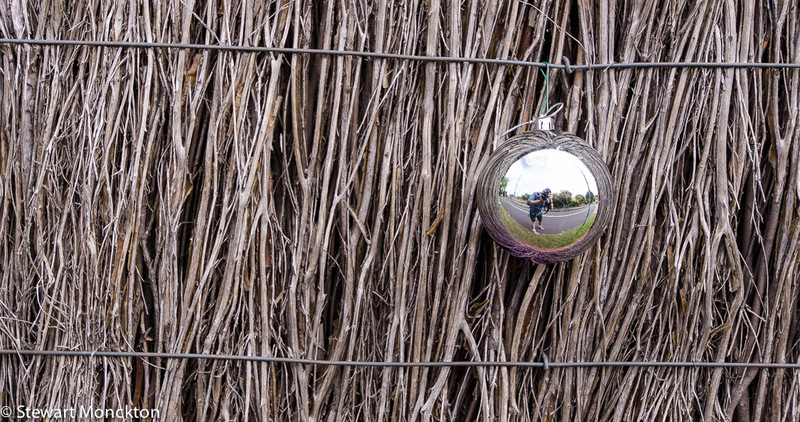 On the walk home from work last week I spotted this silver Christmas globe on a dry stick fence - and I thought it would be an opportunity for that most rare of things, a self-portrait. Its a funny time of year to walk home - some houses are still decked with holly, some have placed the tree on the nature strip in the hope that it will be taken away, some have placed the tree back into the outdoor pot where it lives for 11.5 months of the year, but have forgotten to remove all of the decorations. I can't help but wonder how long the red ribbons will stay on the trees in my street. This is the result of another post Christmas walk. There was a new bike to try out and fresh air to be inhaled. 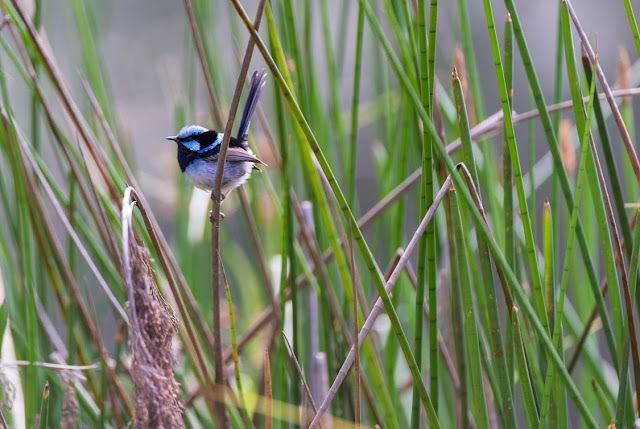 Melbourne is well known for the number of parks and open spaces that it has - and while these are far from being "wild" they are much wilder than my backyard, and as a result I rather like them. 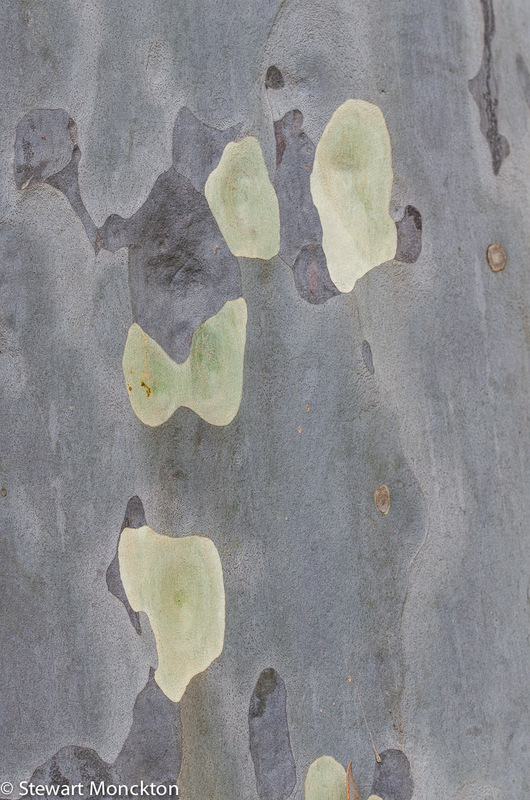 Australian trees are a bit different to most other tree - many of them are eucalyptus - gum - trees, and these do not really occur elsewhere in the world. This species has a smooth bark that flakes off in irregular sections every year. This may explain why many never gain the forest of lichens that cloak many other trees. 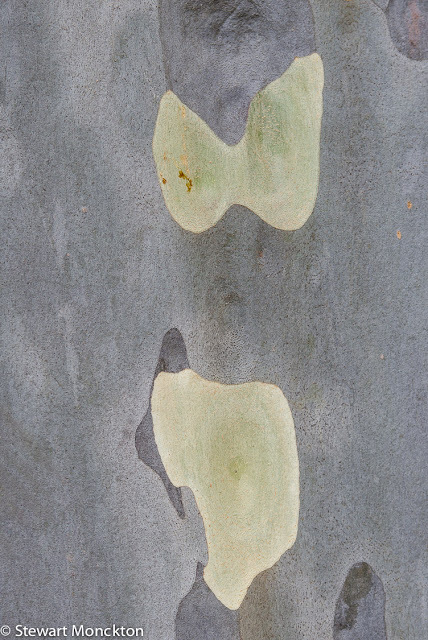 These shots are close ups of the bark of a species of gum. I'm slowly coming back to normal after Christmas and New Year. I tried to get out for a walk most days, in a vain attempt to off-set the impact of the mince pies and cake! 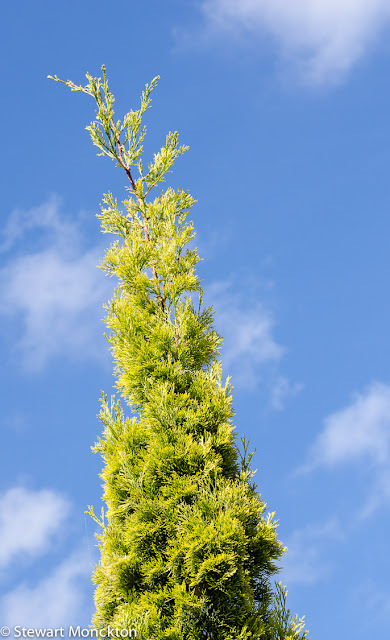 I was rather taken by this contrasting blue and green scene - it's a bit of a combination between the Christmas trees I saw as a kid and the skies I see as an adult. Anyway, its my contribution to Sky Watch Friday. Hello and welcome to 2014! Hopefully, WBW will continue to roll on during this year, so lets get on with it. When I lived in the UK I used to think about waders that "wintered" in the southern hemisphere - and it never occurred to me that they would be in that part of the world during the summer! I suppose it's a kind of "northern imperialism" of the mind! A much better way to think about this is "breeding" and "non-breeding" periods. 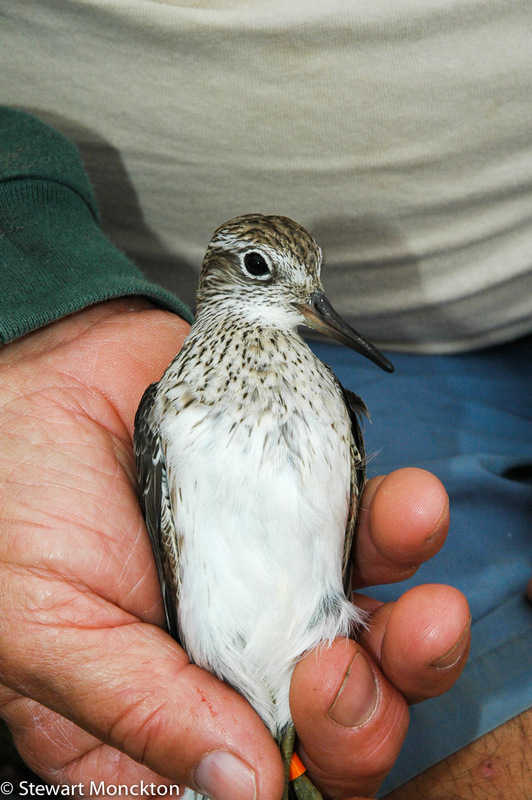 So, many waders spend their non-breeding periods in Australia and there breeding periods in the far north - Siberia and such like. 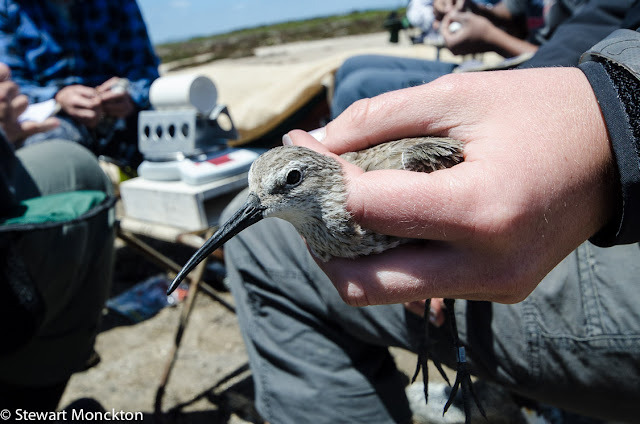 In the days between Christmas and New Year I normally help out with a group that traps these waders as part of a long tern breeding success study. Basically its about catching a representative sample of a number of species so that we can look at the number of juvenile birds. This study takes place at a large sewage works to the West of Melbourne called Werribee - although in the age of spin its now called The Western Treatment Plant! This picture gives you an idea of the number of birds that can gather in small areas. We trap the birds with cannon deployed nets - these fly out over flocks of roosting birds, which are then rapidly extracted and placed in dark keeping cages. Then its all hands on deck to process the birds. These images show the net deploying - to get a better idea of whats going on here, the net is coming towards the viewer. 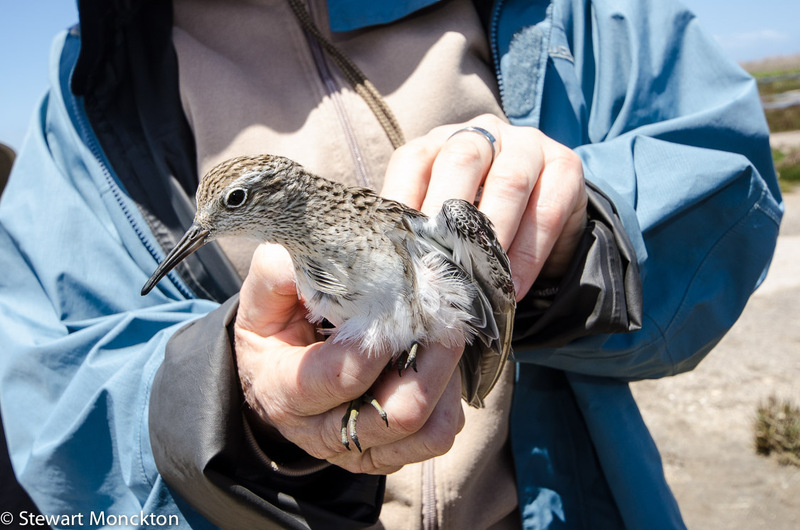 This net trapped about 500 birds - about 300 Red-necked Stints and 100 each of Sharp-tailed Sandpipers and Curlew-Sandpiers. This classifies its as good catch! The birds get the classic metal band (or ring) as well as an plastic orange leg "flag". The flag means the birds from this part of the world can be identifed just by the presence of the flag - and OLF (orange leg flag) means it's one of our birds. I don't always get much time for photography - but during a tea break I got some pictures of some the birds in the hand. Not only are these birds wild - some of them were livid! !